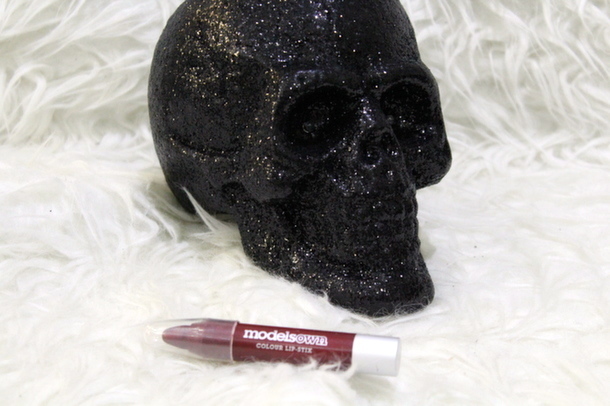 At the moment, I have become obsessed with super dark lip colours. They’re all I want to wear, and being as the weather’s so miserable right now, they’re more than apt for this gloomy time of year, to add a bit of drama. Although MAC have an array of colours to run out and buy in these shades, (and I’ve been tempted to pick up Cyber), I’m not really a high end make up kinda gal, and went straight to the high street to find something so dark berry it’s almost black. 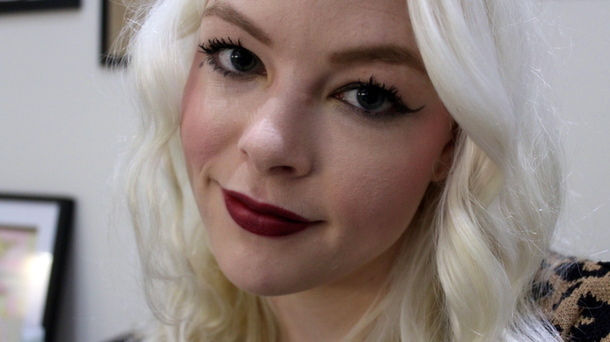 You may know that especially in previous videos, I’ve been rocking Kate Moss for Rimmel’s 107 Wine, which I adore, but it’s still not quite dark enough for me, though a great alternative to a bright red. I happened upon the Models Own Lip Stix in their bottle shop in Westfield and instantly fell in love with Very Berry which is exactly the dark lip I’ve been looking for. The formula is so comfortable and easy to wear, it’s easy to forget you’re wearing more than a lip balm. It’s a very similar formula to my Revlon Just Bitten Kissable Balm Stains which glide on smoothly, can be built up and then stick around for hours afterwards. This colour being darker than my Balm Stains requires more upkeep, but it’s just a case of checking your compact once you’ve eaten to check for smudges which isn’t a massive chore, in no way will it be all gone after eating or drinking though. This is going nowhere without a proper wash with make up remover. At £5 this is an absolute steal, and available from Models Own stands in Boots as well as the Models Own stand-alone bottle shops. You can also pick this up from their online store here, I just think it’s such great value for money, particularly as I was going to spend a lot more on finding the perfect colour. I’d highly recommend this to anyone who loves being a bit daring with their make up and mixing it up once in a while, it’s not going to break the bank after all.